With SM Entertainment’s recent shift into debuting more solo artists from within groups – despite their dungeon of rookies ripe for reaping – Super Junior’s maknae Kyuhyun was not an unexpected choice, at least not in this writer’s opinion. With his regular appearance on Radio Star as MC and frequent work on drama soundtracks, his solo debut has been in the making for quite some time, and even the content of the album itself is not a surprise. 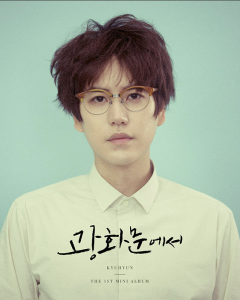 Kyuhyun’s debut album At Gwanghwamun capitalizes on his forte: his lovely voice. There are no bells and whistles for flair or distraction. No, this is a straight ballad album, a tried-and-true formula that works to show off his vocal prowess and to appeal to the masses. In fact, upon its release, the album shot to the top of the charts and has given Kyuhyun wins on several music shows. 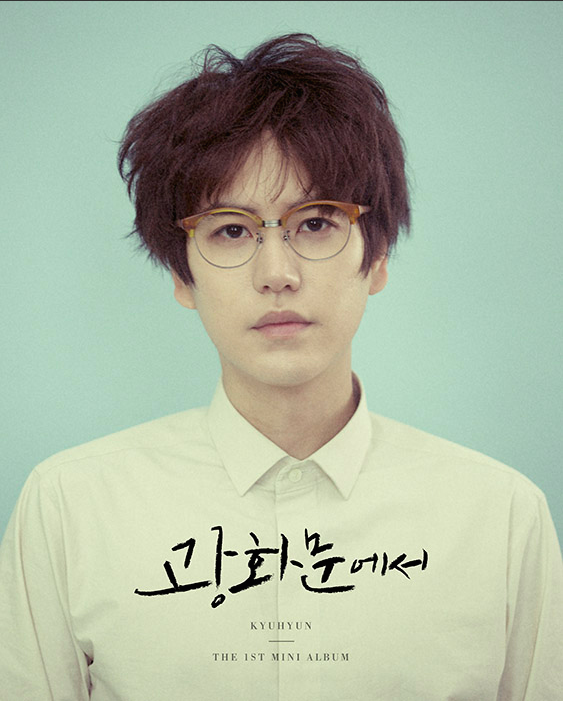 The album opens with eponymous single “At Gwanghwamun.” With its piano-driven melody, the track captivates with its well-timed use of pauses in the instrumentation at the start. The strings swell and grow and then fade out, only to reenter later. With the percussion in there as well, it ends up eliciting a bittersweet feeling as Kyuhyun’s voice rises in pitch and strength at the chorus. The song remains firmly in the regular ballad genre and could definitely fit well on a drama soundtrack with the heartache it expresses. That sentiment is echoed by the lyrics, which are somber in nature as they address the story of someone walking down the street in front of Gwanghwamun on a rainy day and suddenly remembering a lost love. Even though the music video doesn’t interpret the lyrics literally, it captures the mood. With all of the sets, there’s a feeling of distance and sadness that melds well with the song and its message. Despite the painful nature of “At Gwanghwamun,” it doesn’t quite beat that of “Eternal Sunshine,” the next track on the album. Instead of longing, forgetting — or, rather, a desire to forget — takes the stage in this song as it’s about someone wishing they could forget someone because everything, both good and bad, reminds them of what they’ve lost, making it impossible to move on. Lyrics such as “A person called you, the happiness called you, the pain called you” and “Is there a place to hide/From our memories that were so passionate?” really evoke the feeling of being trapped in one’s own head and heart after a break-up. Tied with the restrained nature of the strings and piano, the track’s shining instrument is the ever so subtle electric bass weaved throughout it. The percussion that enters in the second verse is a bit heavy, but it doesn’t really take away from the song either. The next track “At Close” touches on another note of pain: one of regret. Addressing the realization of what one has lost after a relationship ends, the song gives Kyuhyun a chance to flex his vocal muscles emotively. While I’m a huge fan of his technical skill, I’ve always felt that his ability to emote was just not up to par, but this track changes that. Starting so soft and subdued with piano and a tinny electro line behind it, there’s a delicate touch to it as the realization of pain and loss creeps into Kyuhyun’s voice. And then at the chorus it hits full force with the percussion and strings entering. The way he desperately wails “왜” (wae) at the chorus embodies desperation and regret so well it almost hurts. This is undoubtedly my favorite track off the album for that power and emotion in it. Continuing on the note of pain, “Moment of Farewell” brings up something more immediate in discussing the feelings during an actual break-up. With such lines as “You didn’t hate me enough to break up/But you didn’t care enough to love me,” it’s evident that Kyuhyun is supposed to be in a state of confusion and hurt. And while the music succeeds in tugging at the heartstrings, it doesn’t quite reach the bar that “At Close” set with its refined, detailed approach to emotion. Thankfully, Kyuhyun’s ad libs do a wonderful job of distracting us from the simplicity. Despite starting out more along the lines of a typical ballad with full strings, “One Confession” is more piano-driven with a softer strings background. Talking about that one unrequited love that you wish you could confess, the track does well to use a simple piano at the beginning before bringing the full-fledged strings back in. The faint vocals of the first verse are like that unspoken truth, a whisper that fits nicely with the track. The highlight, though, is Kyuhyun using his voice to hold and stretch notes. It almost feels like it’s hurting him to get this off his chest, adding another pop of truly lovely emotion to the album. With its acoustic guitar, “Flying, Deep in the Night” is the most musically different track. Light and upbeat, it’s almost folksy with its percussion and guitar pairing. While the happier tone fits the message of how great love is despite the setbacks (my favorite lyric is “Because I only love you, I dream a foolish dream/Getting lost and wandering in the land of my dreams that can’t come true”), the music seems a bit of an odd choice, as it’s just a touch too fast. On the other hand, it’s great to hear Kyuhyun employ his vocals in a different context than the typical ballad or dance tracks that Super Junior promotes. It really shows his diversity and adaptability, which makes this a great choice to showcase his talent as a vocalist, even if it doesn’t quite fit into the album. Written by TVXQ‘s Changmin, widely known best friend to Kyuhyun, “My Thoughts, Your Memories” ends the album on a somber note. Such lyrics as “How many more cold nights do I have to spend to forget you?” hint at the heart of the song: trying to get over an ended relationship, by even moving on and dating, but failing to forget. Bittersweet and gentle, the track makes excellent use of strings. They grow softly in the background and then disappear to put the spotlight on the vocals, only to subtly make their return again. There’s a kind of fairytale feeling to the track because of this deft hand musically. While some may complain that this album might be somewhat lacking because of its close following of the typical ballad album formula, this is exactly what Kyuhyun needs, as he is known as a ballad singer anyway. It’s a reliable vehicle to let his voice shine on its own. After all, imagine the flip side. Could Kyuhyun really pull off and perform a dance track solo, as Taemin, Zhou Mi or Henry has done? The choice to give him a ballad album actually distinguishes him from his labelmates also debuting. I might even go further to argue that this is exactly the visibility that Super Junior has needed for some time to get back at least some of the relevance that they’ve sadly lost domestically. Overall, I can’t find many flaws in At Gwanghwamun. It hits all the different types of ballads and thoroughly uses Kyuhyun’s voice, providing just enough variety that we need within an album of this genre to keep us coming back for more. Sure, this album will appeal to some and repel others, but we have to remember that this is a ballad album and look at it that way. 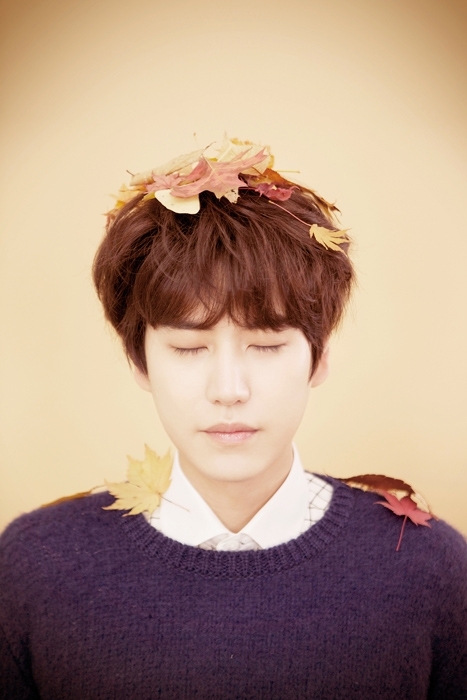 And I can’t help but fall in love with Kyuhyun’s voice with each track.